Surprise, surprise. Mozilla slipped Firefox's built-in Tracking Protection feature into the Firefox 57 stable release next week. While Firefox users could configure Firefox's Tracking Protection feature to run in regular windows as well, it was probably not something that most Firefox users knew about. Tracking Protection is enabled only for websites and services opened in private browsing mode by default. 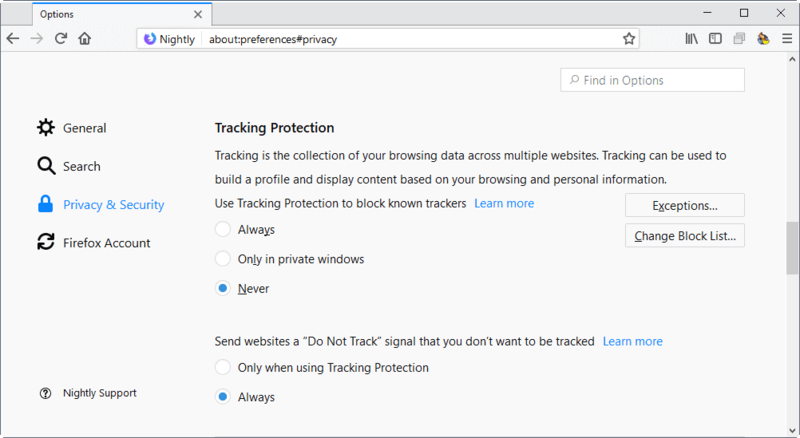 This won't change with the release of Firefox 57; Firefox users who want to extend the blocking need to load about:preferences#privacy to switch the Tracking Protection preference from "only in private windows" to "always" to do so. Firefox users can follow the development on Mozilla's bug tracking site. It was not clear for a long time what Mozilla's plans were for Tracking Protection. The integration as a protective feature for Firefox's private browsing mode was seen by many as an important step for the organization. The organization ran a Tracking Protection experiment some time ago to gather more data. The integration of the option in Firefox's preferences should help boost Firefox's image as a privacy focused web browser. Previous Post: « What's going on with Xmarks for Firefox? > Verify that it’s a radio button with three options (always, only in private windows, never) instead of a checkbox. Did you enable this by chance in user.js? I am using FF52 ESR. In the user.js (about:config), I have ‘privacy.trackingprotection.enabled’ and ‘privacy.trackingprotection.ui.enabled’ set to true. I also have the three radio buttons in ‘options – privacy’ with the always button set. I must have set this. I believe that the user.js settings came from the last user.js published by Pants. Hey, maaan! What’s up dude? Coool yeah. I saw this fridge with wi-fi and usb port but I don’t know, man. I don’t want the government eating my sandwiches and going through my stash. They know man, the government. It is a conspiracy. I don’t buy cookies at the supermarket anymore, I heard some rumors the NSA is doing some business with our cookies, man. When I grow up I wanna be like you, man! Can I say “DL’ed” too? Awesome, dude. Certainly useful in an educational or company environment where you cannot install uBlock origin, but outside of it I fail to see the usefulness. The tracking filters in ublock cover 21670 rulesets (privacy group) to protect their users, how much rules does Mozilla offer by default? Understand I’m not saying it is bad, I’d just be interested how good it is for vanilla no extension users. @HK-Rapper – “I’d just be interested how good it is for vanilla no extension users.” – Probably better than nothing. i think it’s a good thing. Yeah but to quantify? 50% as good? I’ve been using Tracking Protection since FF v54. From the little research I’ve done I think the Tracking Protection list is around 2000 but then I doubt it has any element hiding rules or very few if any site specific exceptions. Sounds small but I can see that FF Tracking Protection is used on maybe half the sites I visit. You mention that uBO covers 21600+ privacy rules (my install shows 21,970 available) but does anyone actually use all of them at the same time? Personally I think that would be crazy because of overlap between filter lists and site breakage. After backing up my profile, I enabled all the privacy options in uBO and almost 18% of the entries aren’t even used because of overlap between lists and anyone that has ever used Ghostery can verify that when you get too aggressive blocking trackers you will break a crapton of sites. I’m not going to test that hypothesis but you are welcome to try using all of the privacy lists for a few days and then let me know how it works out. ;) So… if/when a site breaks what happens then? Do you waste time disabling filter lists one by one? Whitelist that site which will then completely disable any ‘protection’ from potentially malicious ads? No thanks, I’ve seen the results of people wandering around the interwebs without using content blocking. There are advantages to using Tracking Protection vs multiple lists. When a site breaks, and it will happen when using Tracking Protection or multiple lists, it is very easy to disable Tracking Protection on a site. The icon is on the left side of the urlbar. If Tracking Protection is working or disabled on a site the icon will be visible. If it’s not needed the icon will not be visible. If some type of functionality is not working on a website, Tracking Protection is the first thing I try, takes like two seconds to disable it from the urlbar, for that specific website. If a website needs to be whitelisted in your content blocker, for any reason, I have yet to see an ad when only Tracking Protection is enabled. And so far I have not experienced any problems when making purchases online. The biggest problem I’ve experienced is sites embedding ‘images’ from Tweeter and Instaporn that end up not being visible. I finally got around to submitting feedback to Disconnect but have no idea if the image problem will be resolved. After running a short experiment I have to correct my earlier statement. First I have to give credit to gorhill for doing an excellent job of fine tuning the available default lists in uBlock Origin over the last couple months. I am surprised, embarrassed and reluctantly have to report that using a combination of Adguard Spyware Filters, EasyPrivacy and Fanboy’s Enhanced Tracking List did not break any websites, as I implied earlier, in the short time that I’ve been using them together. Also the 8 websites that I had to whitelist when using FF Tracking Protection were fine when the 3 privacy lists were being used together. It’s been a long time since I tried using multiple privacy lists and back whenever that was it created problems for me. I’ve decided to keep using FF Tracking Protection because it works great when uBO is disabled or a website is whitelisted. It’s also time to modify my uBO filter list. Adguard Base Filters being used along with EasyList was a two month experiment, Adguard didn’t break any sites but I also didn’t notice any improvement so it’s going away. Out of the three privacy lists I’ve decided to use EasyPrivacy and Fanboy’s Enhanced Tracking lists together. Those two have very small overlap, 99.5% of the entries are being used. For years, Fanboy’s different lists have been offered bundled with EasyList and EasyPrivacy so I’m thinking some effort was made for them to work in conjunction with each other. Anyway… I hate being corrected by my own testing. Sorry! What a maroon… what an imbessile (imbécile)! Bad thing is – “Do no track” header is also forced when tracking protection is enabled. Far better than nothing at all. Most browsers already have some basic content blocking as far as script auditing and safe browsing api’s. This is a good balance for someone who doesn’t wanna block all adds and prevent content creators from getting their revenue, while still not wanting to store ad cookies and be effected by some malvertising. Tor browser won’t even add an adblocker outright because it messes with the fingerprint of the browser and makes the browser stand out. I get why he chose not to. I do, however, wish they’d take some of Noscript’s functionality and put it in Firefox’s backend though. Wishful thinking, but that would be a nifty thing to complement tracking protection. i used to leave Firefox’s tracking protection in private browsing mode off because i used to have Disconnect installed with uBlock Origin, Privacy Badger and Blur. i don’t use Disconnect and Blur anymore, just uBlock Origin and Privacy Badger. Firefox’s tracking protection list is based off of Disconnect, my point is i wonder if Firefox 57 would be slightly faster-(probably not noticeable) by blocking some of the tracking with Firefox instead of uBlock Origin and Privacy Badger? Basically taking a tiny bit of the burden of of those 2 extensions. Like i said probably not noticeable at all, but i might give it a try, but will probably just let the 2 extensions handle it as it would be quicker to fix any web site breakage. Anyway, it’s nice Mozilla is doing this with Firefox. To see all three options, I had to set privacy.trackingprotection.ui.enabled to true. Obviously, I am missing something in the article glorifying Mozilla for adding Disconnect as an option for Tracking Protection. How does that relate to the article? I wonder if this prevents click-through rebates/cashback sites from working properly. The Tracking Protection is the Disconnect.me add-on. Nothing more unless I am missing something. Most users install it sooner rather later when setting up a browser. The Sea Monkey Project blurb simply hints that there is still an active FF based browser that isn’t making a wasteland of FF. Firefox Tracking protection blocks ads on Ghacks. Aren’t you afraid of revenue loss? In other news, Mozilla is going to integrate Tor into Private Browsing mode, in the future. The two teams are getting so close that Tor itself is going to have changes to facilitate the embedding, much like Servo components like WebRender and Stylo have had changes to fit into Firefox. That requires a high level of cooperation. Mozilla is also hoping to help orient Tor towards standardization so that more browsers can use it, but it’s not going to happen any time soon because Tor protocols and stuff are not in a shape where they can be standardized at this point. The Firefox’s built-in tracking protection is a totally useless feature. It breaks websites or features in websites and people won’t know why things don’t work in private mode, and it doesn’t have any options besides disabling it. It’s also useless because it’s a poor replica of a adblocker addon (uBlock). Tracking refers to the collection of a person’s browsing data across multiple sites. The Tracking Protection feature uses a list provided by Disconnect to identify and block trackers.